Wash the rice in a bowl and drain the water. Bring the stock or water to a boil on high heat, then add the freshly washed rice to the pot (include the pork tenderloin at this point, if you are wanting to include it). Turn the heat down to low heat and simmer. Cooking the congee will take about 2-3 hours, unless you have a pressure cooker, in which case it will take closer to 45 minutes to an hour. The longer you boil it, the more the rice starts to break down and fall apart. This is what you want. It’s not possible to overcook the rice when you’re making congee. The congee only gets better and smoother in texture the longer you simmer it. When you’re done, the consistency will be that of a slurry. If you’re wanting to add some white fish, you should do so at this point and simmer the pot further until the fish is done. Keep an eye on the fish so it doesn’t overcook. After the congee is done, you can add any of the garnish ingredients listed above for added flavour. As an additional note, the ratio of rice to liquid is very flexible and can be adjusted, depending on your personal preference. If you prefer a soupier consistency, reduce the amount of rice, or add more stock or water. For a thicker, more porridge-like congee, add more rice or reduce the stock or water. I like my congee inbetween: not runny, but not sticky and thick either. If in doubt, check the pot, give it a stir and add more rice or liquid according to your preference. You can also add more rice and liquid to the congee at any time to extend the pot into even more meals. Normally, once I hit the 2/3 or half-way point in my pot, I’ll add about 2 to 4 cups of water, and a 1/4 to 1/2 cup of rice to the already cooked congee (depending on how much more congee I want to make) and start the process again. This time, it’s important to stir the congee as you’re bringing it up to a boil, particularly along the bottom of the pot to make sure the rice doesn’t stick to the bottom and burn. If you’re making a thicker congee, this is even more important. 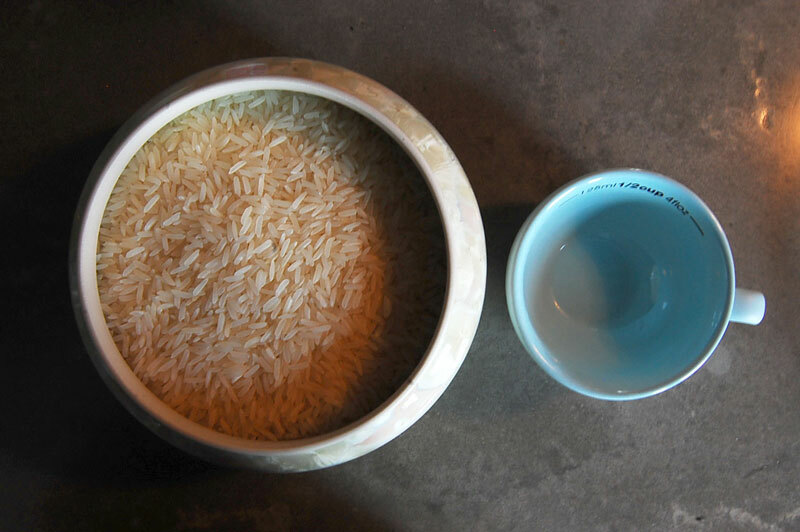 I would recommend adding an additional cup of water to loosen up the rice a little, and check on the pot more frequently, giving the pot a good stir when you do. The cooking time for the congee extension is usually around 30 minutes to an hour. If you master the plain congee, all other kinds of congee will be easy to make. Stay tuned for other congee recipes in the future. This entry was posted in Mains, Vegetarian and tagged Chinese, comfort food, congee, rice, sick remedy. Bookmark the permalink. Great recipe, Vivian! I’ve always wanted to make congee, but I haven’t tried yet. It’ll be particularly comforting given the freezing weather outside! Thanks, Stephanie! I’m glad to be able to contribute to your first congee experience! I hope it goes well. It’s a mainstay for me now, I don’t know what I’d do without it. Especially in these frosty months. Thanks for this…Seems quite easy. I’ve been getting stomach issues, and I’m getting tired of just eating burnt toast. Nice to make one’s own congee. The congee at local cafe is a little too salty, too thick (I also like it not too runny or too thick), they serve it lukewarm, and I’m not sure how fresh it is. My mother is Latina and grew up with a different variation…rice water = high ratio of water to rice (maybe cinnamon stick or other spices added). The thick liquid is drained and served warm. It’s nasty though…hahah. Hi Surlette, thanks for your comment! I’m glad to have been able to help. It really is easy, and the best part is you can just keep adding to it. Congee’s saved me more than a few times – especially when either I or my partner has been sick. It sounds like maybe I need to try this cinnamon version. 🙂 Sounds intriguing. This used to be once a month dish for us back in the Tamil Land, not long ago. A sizeable rural population still eat this as their daily meal. Kinda getting lost these days in the urban region though. Just before monsoon sets in (August/September), the tamils celebrate a day where Congee is served to all passer by (until ofcourse they run out). It is served with a spinach variant that is highly medicinal. The tamils follow this tradition for thousands of years. There is tamil literature (Sangam Age) dating back to 200 BC that mentions of Congee and its vaccine effects from ‘flu’. The recipe originally was used by tamil farmers, passed to portugese, british and the chinese. It is sad today that this is being referred as an Asian recipe. Not against Asian food. I love it to death. But it just makes me feel bad in the mouth when I see the dish that was eaten by me as I was growing up being labelled as something else. Worst is no mention of its origin. Thank you for your comments and also for providing historical context behind congee. You’re absolutely right, there are many, many forms of congee around the world, with the original name “congee” originating from the Tamil word “kanji”. This recipe I posted to my blog was really intended to capture how I happen to make this particular type of Chinese congee that I grew up with as a child. It’s really not meant to represent all forms of congee – particularly as so many different types now exist. The original intent of this post and my blog in general is not as an end-all or be-all of information, but just to share recipes my sister and I have been inspired by or created and loved. I certainly don’t mean to offend, but to offer something positive to others who may be interested in different types of cooking. If you have a recipe of the original ancient Tamil congee you grew up with, I’d love to post it. Indus, It’s great to learn of the tradition of congee. Do you happen to know what kind of rice was being grown when congee was made? Following traditions of food is like following the wanderings of man!